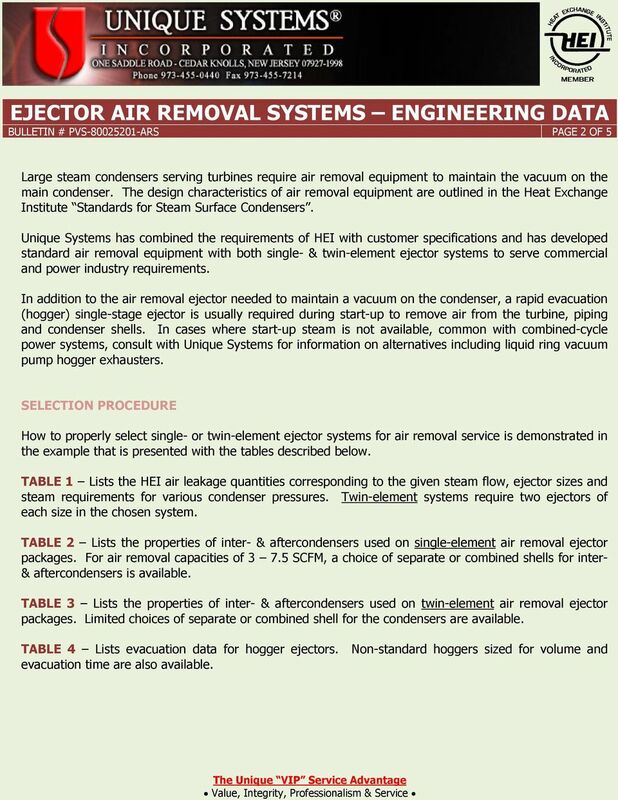 Download "EJECTOR AIR REMOVAL SYSTEMS ENGINEERING DATA BULLETIN # PVS-80025201-ARS PAGE 1 OF 5"
2 BULLETIN # PVS ARS PAGE OF 5 Large steam condensers serving turbines require air removal equipment maintain the vacuum on the main condenser. The design characteristics of air removal equipment are outlined in the Heat Exchange Institute Standards for Steam Surface Condensers. Unique Systems has combined the requirements of with cusmer specifications and has developed standard air removal equipment with both single- & twin-element ejecr systems serve commercial and power industry requirements. In addition the air removal ejecr needed maintain a vacuum on the condenser, a rapid evacuation (hogger) single-stage ejecr is usually required during start-up remove air from the turbine, piping and condenser shells. In cases where start-up steam is not available, common with combined-cycle power systems, consult with Unique Systems for information on alternatives including liquid ring vacuum pump hogger exhausters. 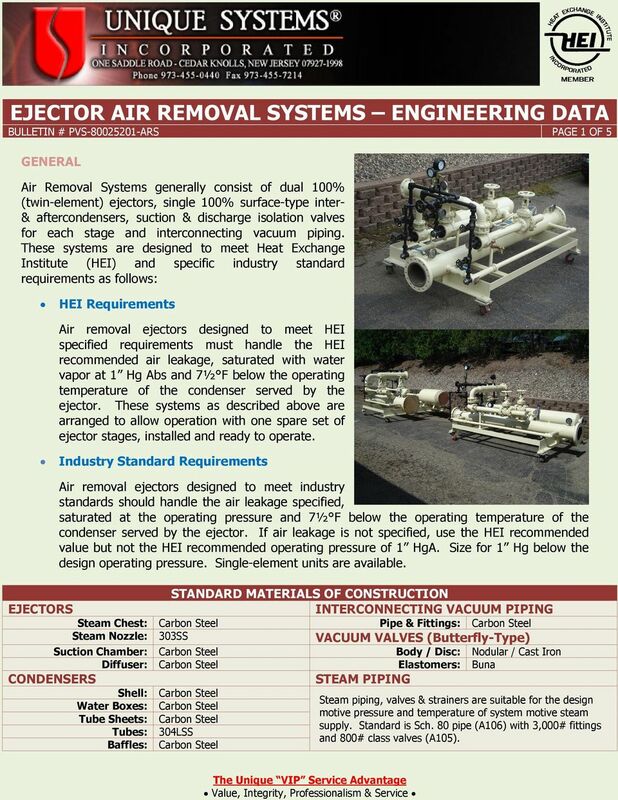 SELECTION PROCEDURE How properly select single- or twin-element ejecr systems for air removal service is demonstrated in the example that is presented with the tables described below. TABLE Lists the air leakage quantities corresponding the given steam flow, ejecr sizes and steam requirements for various condenser pressures. Twin-element systems require two ejecrs of each size in the chosen system. 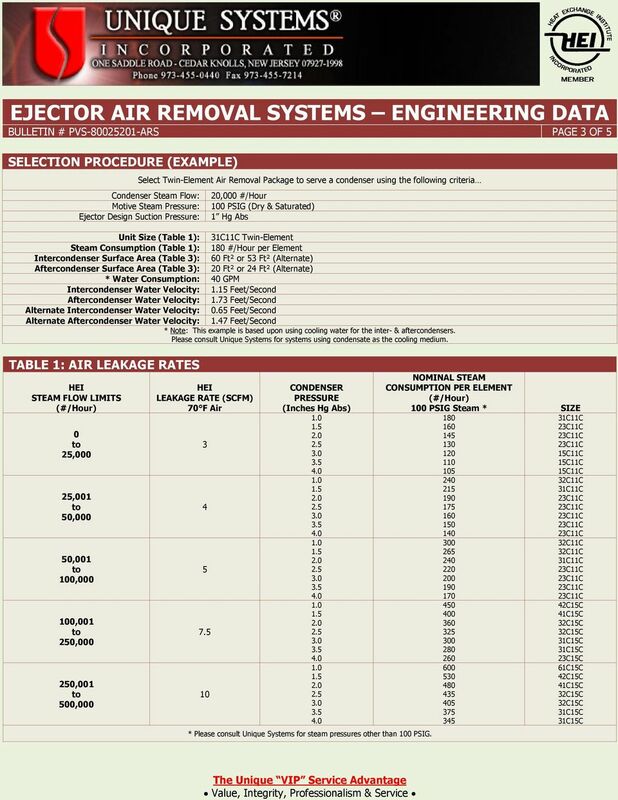 TABLE Lists the properties of inter- & aftercondensers used on single-element air removal ejecr packages. For air removal capacities of 7.5 SCFM, a choice of separate or combined shells for inter- & aftercondensers is available. 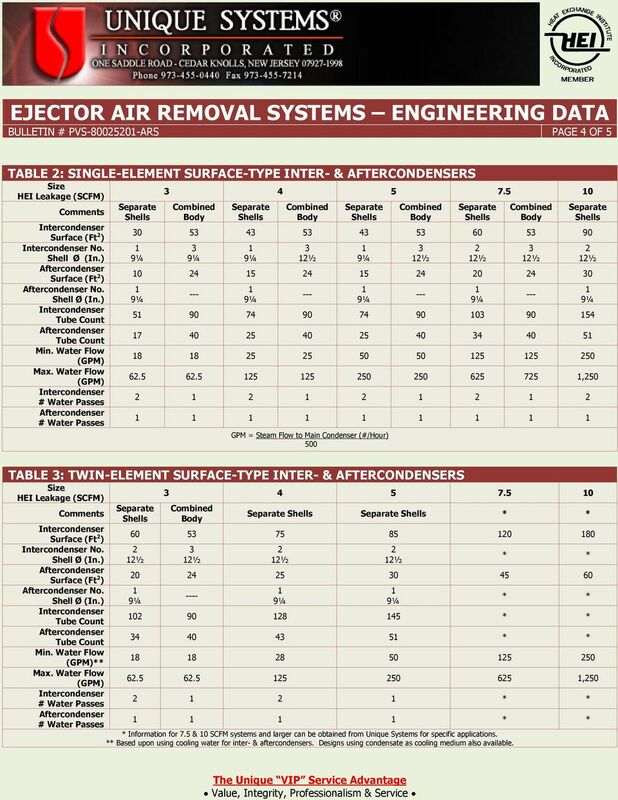 TABLE Lists the properties of inter- & aftercondensers used on twin-element air removal ejecr packages. Limited choices of separate or combined shell for the condensers are available. TABLE 4 Lists evacuation data for hogger ejecrs. Non-standard hoggers sized for volume and evacuation time are also available. 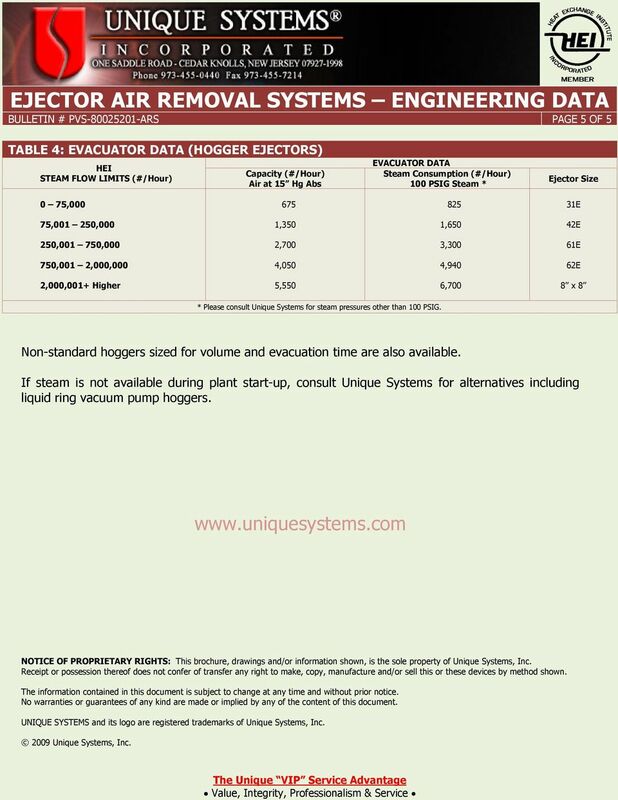 5 BULLETIN # PVS ARS PAGE 5 OF 5 TABLE 4: EVACUATOR DATA (HOGGER EJECTORS) STEAM FLOW LIMITS (#/Hour) Capacity (#/Hour) Air at 5 Hg Abs EVACUATOR DATA Steam Consumption (#/Hour) 00 PSIG Steam * Ejecr Size 0 75, E 75,00 50,000,50,650 4E 50,00 750,000,700,00 6E 750,00,000,000 4,050 4,940 6E,000,00+ Higher 5,550 6,700 8 x 8 * Please consult Unique Systems for steam pressures other than 00 PSIG. Non-standard hoggers sized for volume and evacuation time are also available. If steam is not available during plant start-up, consult Unique Systems for alternatives including liquid ring vacuum pump hoggers. NOTICE OF PROPRIETARY RIGHTS: This brochure, drawings and/or information shown, is the sole property of Unique Systems, Inc. Receipt or possession thereof does not confer of transfer any right make, copy, manufacture and/or sell this or these devices by method shown. The information contained in this document is subject change at any time and without prior notice. No warranties or guarantees of any kind are made or implied by any of the content of this document. UNIQUE SYSTEMS and its logo are registered trademarks of Unique Systems, Inc. 009 Unique Systems, Inc.
By: S.G. Ketterer and C.G. Blatchley The use of steam jet ejectors for entraining air or gases at subatmospheric pressures is increasing rapidly, particularly in the range of pressures below mm absolute. GAS HANDLING SYSTEMS VACUUM INSTRUMENT CORPORATION 2099 Ninth Avenue Ronkonkoma, NY 11779 www.vacuuminst.com Smart Charge II An advanced gas backfill and evacuation system with built-in gross leak test. Specific Volume of Liquid (Column 7). The volume per unit of mass in cubic feet per pound. Air-sourced 90 Hot Water Supplying Heat Pump "HEM-90A"
6.33 In a jet engine a flow of air at 000 K, 00 kpa and 30 m/s enters a nozzle, as shown in Fig. P6.33, where the air exits at 850 K, 90 kpa. What is the exit velocity assuming no heat loss? C.V. nozzle. P O B o x S t. L o u i s, M O P h o n e : ( ) ~ E m a i l : w m h u i t a o l.
PART 1 - GENERAL 1.01 Work included: A. Piping, tubing and fittings. B. Piping specialties. C. Special duty valves. D. Refrigerants. E. Chillers. F. Refrigerant monitors. 1.02 General requirements: A.